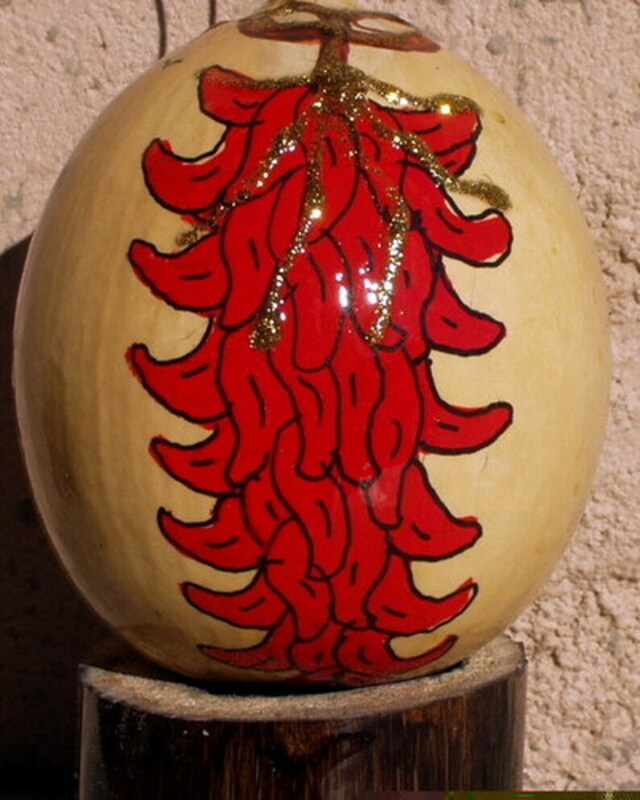 Hand-Painted Gourd with Chile Ristra painting by handpaintedgourds.com. Colorful design. Great for the pepper lover, Christmas tree ornament, collector or for a wonderful special art gift. This design is painted on a Wild Buffalo Gourd found in the desert of New Mexico.It makes an interesting gift, special art piece, collectors item, or Christmas ornament. I was featured in "New Mexico Magazine". This is an ORIGINAL Hand-Painted piece of art. Roadrunner with Red Chile Hand-Painted Gourd Christmas Ornament by artist Sandy Short of handpaintedgourds.com. Hand-Painted Gourd Christmas Ornament by Artist Sandy Short "Chile Ristra"
Hand-Painted Gourd Christmas Ornament by Artist Sandy Short "Turquoise and gold NATIVITY" design DECORATION.